GetResponse is the ideal platform for managing the lengthy sales cycle of the real estate business — from prospecting to selling, customer education to staying in touch. Discover built-in tools, full-featured enough for design professionals and easy enough for beginners. Convert website visitors into engaged prospects who need help buying a home. 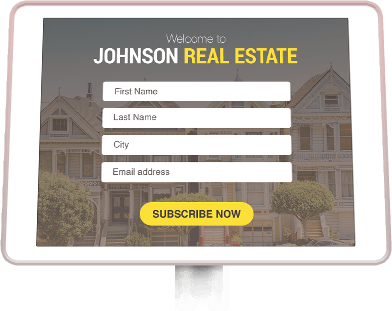 Add signup forms for visitors to receive new listings for homes and properties. 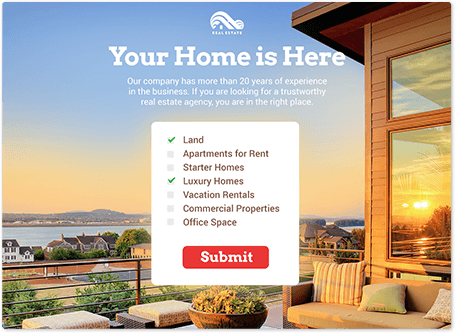 Create landing pages with in-depth information about real estate listings. Use list management tools for follow-up campaigns that turn leads into engaged prospects. 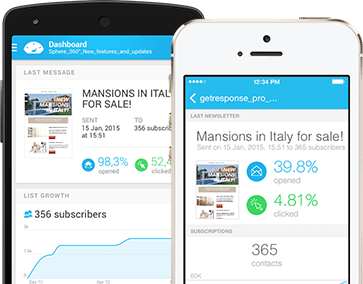 GetResponse lets real estate agents transform new acquaintances into engaged contacts. Use a mobile tablet to register in-person contacts at open houses. Display QR scan codes to give house shoppers more information, when you’re not around. Auto-assign leads to email campaigns that introduce you and your real estate listings. 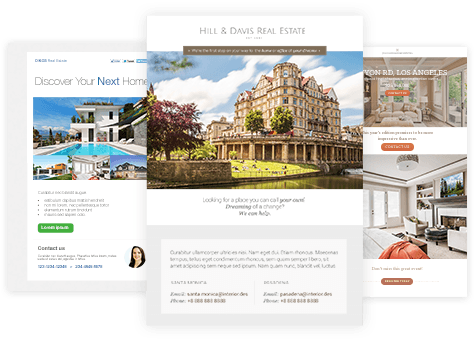 Use drag-and-drop tools to communicate with real estate clients in powerful new ways that lead to sales. 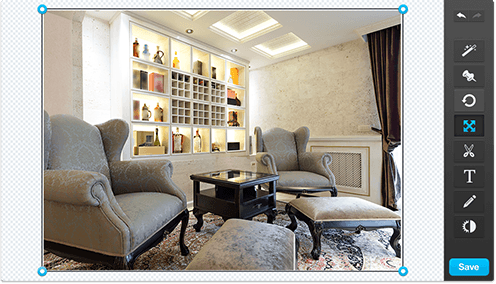 Create landing pages with images of interiors, videos of exteriors, and unlimited text. Email a video walk-through of a prestigious home you’re marketing to protect the seller’s privacy. Shift real estate prospects from general to specific campaigns based on time or responsiveness. 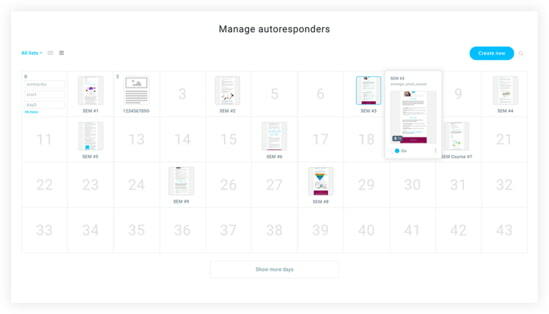 Send autoresponders on a customized schedule you set in advance. Design campaigns that update distribution lists with new contacts, location changes, and more. 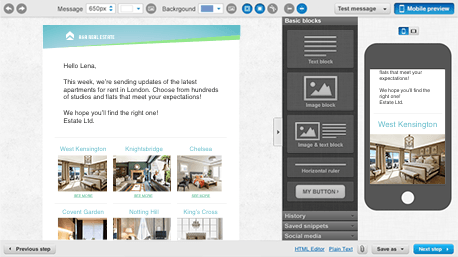 Use GetResponse creative tools to feature properties in an appealing way. Dress up messages and landing pages with images, logos, graphic elements, text boxes and video. Use image editor to adjust real estate images inside our email editor. Check how your messages will look in browsers, platforms, and email programs. Send real estate information in several formats to reach prospects and clients in a style that suits them best. Keep your stay-in-touch messages fresh and exciting with designer templates for seasons, holidays, and special offers. Organize webinars or insert a video of a new listing in your email newsletter. Create autoresponders that keep prospects engaged until they need your services. Let your customers share your messages and landing pages via social media channels. Increase readership by making your emails easy to read on mobile devices. Send mobile-friendly emails, thanks to GetResponse’s pioneering work in responsive email design — an industry first. Design campaigns, confident that emails automatically adjust to fit any screen size. Use one-click inbox preview to ensure your messages look perfect in every mailbox. Optimize real estate marketing campaigns using tools and reports with insights for continuous improvements. Use A/B testing to find out which version gets opened and clicked, to optimize response rates. 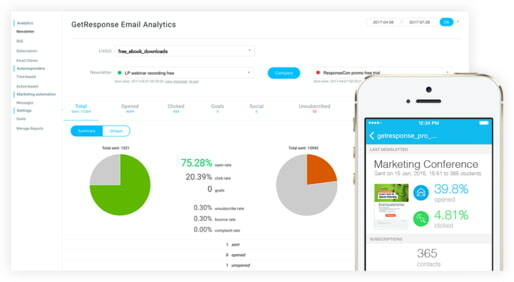 Monitor email campaign performance, with real-time updates as results come in. Create targeted email campaigns for contacts by location, interest, demographics. Manage real estate marketing lists using GetResponse tools integrated with popular platforms and software. Consolidate contacts from digital files and multiple contact management programs. 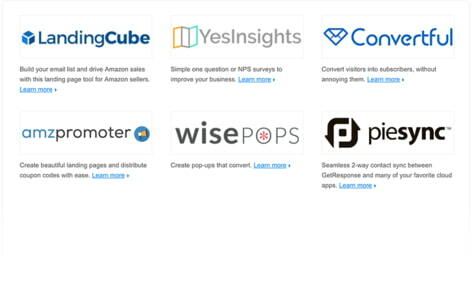 Explore our App Center for 100+ free API integrations with popular CRM, CMS, and social platforms. Visit the Dev Zone for free resources to help your programmers create custom integrations. Give your agents instant access to GetResponse marketing tools. Find out all GetResponse can do for your real estate agency.